In the Central Council for Research in Unani Medicine (CCRUM), the applicants have invited applications for recruitment of 2 vacant posts of the accountant, junior accountant. Interested candidates can apply before the deadline by reading the given instructions. The last date for application is 09 December 2018. Candidates for these positions will be selected on the basis of interview and experience. Educational Qualifications – Visit the Central Council for Research in Unani Medicine (CCRUM) website for the academic qualification and other information . Selection Process – Based on Interviews and Experience How to apply – For detailed authorization notifications and other information, please see the Employment News paper 10 – 16 November 2018 Page No.43. Apply soon – 2 vacant posts of the accountant, junior accountant In the Central Council for Research in Unani Medicine (CCRUM). Interested candidates can apply before the deadline by reading the given instructions. The last date for application is 09 December 2018. 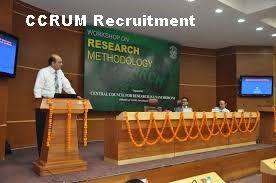 Candidates for these positions will be selected on the basis of interview and experience.The Central Council for Research in Unani Medicine (CCRUM) is an autonomous organization under the Ministry of AYUSH, Government of India. Since its establishment in 1978, the CCRUM as the apex government organization for research in Unani Medicine has been engaged in conducting scientific research on the applied as well as fundamental aspects of Unani system of medicine. Consequently, over the past four decades of its existence, the Council has made significant strides in clinical research, drug standardization, survey and cultivation of medicinal plants, and literary research. Besides, research-oriented health extension services, and information, education and communication (IEC) activities have also been part of the Council’s programmes. With the efforts of over 300 scientists and technical manpower at its 23 research centres spread across the country, the Council has won appreciation from various quarters for its patents which are eight in number, innovative research outcomes, and scientific publications.